The Saint Presents Shoobies (Five best friends from the irrelevant suburbs of the Jersey Shore attempting to make melodic sounds. Shoobies began as a collective effort to escape the inevitable small town boredom, and blossomed into an all encompassing passion inspired by love.) (11:15pm) / From Nashville, TN, Jet Black Alley Cat (10:15pm) / Sonic Blume (9:15pm) / Ocean Heights (8:15pm) / Flipturn (12:15am). Justin Lube Presents Brian Wood's EP Release Party with Baron Praxis / Judo Chop / Hey Leroy / The Skullers and special guests. The Saint & Little Dickman Records Present From Los Angeles, CA/Japan, Acid Mothers Temple (Psychedelic Rock Krautrock Noise Folk Improv) / From Toronto, Canada, Yamantaka / Sonic Titan (Noh-Wave prog collective, a black-and-white (and sometimes red) theatre company, an operatic psych cult, rock band and the speculative prophets of humanity's impending doom.) and special guests. Acid Mothers Temple is a Japanese psychedelic rock band, the core of which formed in 1995. The band is led by guitarist Kawabata Makoto and early in their career featured many musicians, but by 2004 the line-up had coalesced with only a few core members and frequent guest vocalists. Kawabata initially formed Acid Mothers Temple (originally "Acid Mother's Temple") with the intention of creating "extreme trip music" by editing and dubbing previous recordings, being influenced by progressive rock, Karlheinz Stockhausen, and krautrock. The Saint Presents Rock Indie feat. ManDancing (10pm) / Seamstress (9:15pm) / From NYC, Matt Sucich ("Matt Sucich is my favorite New York Songwriter. The way he writes, the detail of it, and the effortless brilliance of his guitar playing," said Adam Duritz from Counting Crows, 8:30pm) / Brewster (7:45pm) / Fire Is Motion (10:45pm). H.A.G.S. The World's First Comedy Show Ever Hosted by Joe McAndrew and JC Hendricks at Asbury Park Brewery feat. COMEDIANS: Marv (Stress Factory), Allie Mae (The Stand, NYC), Tiz Irie (Stress Factory, March Madness Winner), Meghan Radespiel (The Village Lantern), Max Antonucci (Times Square Storytelling Festival), Brian St. John (Pizza Boys Podcast), Ryan Roman (Hoboken Comedy Festival). Music from Party Wave. Prizes by Rebel Supply Co.
Hip Hop: Pappy NJ Productions X Jethroswagg Present "Too Much Swag" Showcase Featuring Red Freck / C Henry / Nuttzo Krazee / Rijo Thedon / Tony Lit / Slicknick / Bank Boys / Lilzaywave / Monster Movie / JoeCali / Droppinz and special guests. Asbury Park Music + Film Festival Presents From Los Angeles, CA, Here Lies Man (They took the music world by storm in 2017 with their self-titled debut positing the intriguing hypothesis: What if Black Sabbath played Afrobeat?) / Ribeye Brothers / The Tide Bends / DJ Foggy Notion. Variety Show: Warm Things Comedy Presents: Dan and Melissa Turn Off The Dark, Featuring Music from Mike Costaney & Richie Brown / Heather Cook / Comedy by Cory Snearowski / Allie Mae / Reggie Parker / Eric Knittel / Waldo Maldonado. After years of small-scale fraud and ALLEGED murder, Dan and Melissa have finally decide to become good with the help of their mentors, Ian and Chelsea. That is, until Ian and Chelsea invite them to participate in a fundraising drive, prompting Dan and Melissa to get so competitive that it verges on criminal. Can Dan and Melissa walk the path of righteousness, or will the team of mercenaries they hired to help them raise money steer them back to a life of petty larceny? I honestly am not sure yet! The Saint Presents (Early Show) featuring From Boston, MA, The Ballroom Thieves (Alternative rock and folking roll. As heard on 90.5 The Night WBJB-FM.) and special guests. Tickets on sale Tuesday, March 19 at 11am. The Ballroom Thieves - Calin "Callie" Peters (vocals, cello), Martin Earley (guitar, vocals), and Devin Mauch (percussion, vocals) - mine immense melodies and hypnotic hooks from personal stories on their 2018 EP, Paper Crown (Nettwerk Records). Under the cover of vintage jazz-style, the five songs reflect feelings of rootlessness from four nomadic years, bouts of depression, and the ever-looming specter of political unrest hanging over the country. (Early Show) The Saint Presents Val Emmich (New release, "Tizzy," documents an intense year of anxiety and depression - and therapy. Out now on vinyl/digital.) (9pm) / The Remnants (7:45pm). All Age Matinee: Sunsets From Jupiter / From Hartford, CT, Bonsai / Ross Owen and The Tribe and special guests. The Saint Presents Rock feat. Cinco de Mayo Featuring Rockit Fish (featuring them songs of Stone Temples Pilots) / Plenty of Excuses (Alice In Chains, A Tribute Show). The Saint Presents Rock Acoustic feat. From NYC, Dylan Hartigan (I'm an actor, singer and songwriter, top 24 on Season 14 of The Voice on Team Kelly!) / Jillian Rhys McCoy & Ron Haney / Emily Grove and special guests. The Saint Presents Rock feat. The Bilsby Brothers Band and special guests. (Early Show) The Saint Presents From Nashville, TN, Ben Sparaco and The New Effect and special guests. On Sale Friday 2/15 at 10am. Ben Sparaco and The New Effect is a genre-defying trio based out of Nashville, Tennessee. Led by young guitarist/singer/songwriter Ben Sparaco, the band features Adam Discipio and Anthony Quirk on bass and drums respectively. Between the three you an hear influences from modern indie rock, classic jam bands, Blue Note era jazz, and everything in between. Ben Sparaco and The New Effect formed in 2017 when Florida-born singer, songwriter, and guitarist began playing with drummer Anthony Quirk and bassist Adam Discipio. Now based in the flourishing musical oasis of Nashville, TN, Ben and the band have maintained a massive touring schedule, cutting their teeth playing coast to coast in clubs and festivals. Sparaco spent his teen years making a name for himself in the jam scene of the southeast, playing with members of the Allman Brothers Band, Dead and Company, Tedeschi Trucks Band, and more before he had even turned 21. This included a touring stint in late Allman Brothers drummer Butch Trucks' band. After recording his 2016 release "Bring the Jubilee EP" with a Florida-based group of musicians, he moved to Nashville. There, he amassed a group of some of Nashville's finest to record his debut solo record "Wooden" with producer Ross Holmes (Mumford and Sons, Bruce Hornsby, Warren Haynes), which also featured a guest appearance from Luther Dickinson. After finalizing The New Effect's powerful lineup with Berklee College of Music graduates Quirk and Discipio, Sparaco's songwriting started drifting from his southern rock roots, showing indie rock, new wave, and pop influences, evident on the EP "Greetings, from Ben Sparaco and The New Effect." Following this with the single "Scared of The Dark" in the fall of 2018, Sparaco and his band have earned glowing press reviews, further establishing themselves as up and comers to watch in the indie rock world. The Saint Presents Rock Indie feat. From Boston, MA, Mint Green / Love Your Friends / Magic Ghrelin (feat. Members from Teenage Halloween) / Beauty. The Saint Presents From Minneapolis, MN, Bad Bad Hats (New album "Lightning Round" out August 3rd via Afternoon Records. Since the release of "Psychic Reader," Bad Bad Hats has toured the U.S. extensively, supporting artists including The Front Bottoms, Margaret Glaspy, Hippo Campus, and Third Eye Blind.) Tickets On Sale: Friday, March 29th. Alexander and Hoge met while attending Macalester College in Saint Paul, Minnesota. In 2012, they formed Bad Bad Hats with friend and bassist Noah Boswell, and began performing around the Twin Cities. That same year, they were signed by Minneapolis label Afternoon Records. Their 2015 debut album "Psychic Reader" caught the attention of outlets including The New Yorker, NPR, Pitchfork, and Paste. The Saint Presents Rock Groove feat. From Brooklyn, NY, Dub Trio (Dub Trio's sound gets chopped apart, bounced across speaker channels and charged with subsonic frequencies. This is dub as mixing-board art form, not as literal genre exercise, and it's absolutely fugging massive.) and special guests. The Saint/House of Independents (AP) Presents Rock: From London, England, Skinny Lister (New Tracks '38 Minutes' and album title track 'The Story Is...' OUT NOW ahead of the album release March 1.) and special guests. On Sale Friday Feb. 8 at 10am. The Saint Presents (Early Show) feat. Rock: From Brooklyn, NY, Feat. High Season feat. Jack Petruzzelli (Jack Petruzelli's knowledge of the guitar and keyboards have been heard around the world alongside musical legends such as Patti Smith and Ian Hunter, Rufus Wainwright and Joan Osborne.) / David Vargo and special guests. (Late Show) The Saint Presents Rock Groove feat. from Charlottesville, VA, Kendall Street Company (The Company has broken out of the college bubble and into a world that loves to groove to a great live show.) with special guests. Coming from Surf City USA, Pacific Dub resides in Huntington Beach which is nestled nicely in southern California's Orange County. Other bands such as Korn, The Offspring, Avenged Sevenfold, and The Dirty Heads all have members that call this surfer's paradise home. Combining catchy choruses, heavy rock n' roll guitar melodies, and smooth hip-hop and reggae rhythms are all significant characteristics that add to Pacific Dub's coastal vibe, and genuine objective of creating innovative alternative-rock-reggae while sharing a message of love and peace. The Saint Presents From Los Angeles, CA, Hannah Wicklund & The Steppin Stones (The band is fronted by 21-year-old powerhouse guitarist, vocalist and songwriter, Hannah Wicklund.) and special guests. Fronted by 21 year old triple threat vocalist, songwriter and guitar player, Hannah Wicklund & The Steppin Stones boasts a resume that can be hard to match for most multi-decade musicians. With over 2,500 shows under their belt, three completed albums and festival appearances at Peach Music Festival, Firefly Music Festival and Kaaboo Del Mar, Hannah Wicklund & The Steppin Stones are on their way to becoming Rock & Roll's next marquee act. Formed in 2006, by a then eight year old Wicklund, the band has come along way from playing Janis Joplin and Neil Young covers. Between then and now,Hannah Wicklund & The Steppin Stones have been billed alongside legacy acts such as Jefferson Starship, Kansas and The Marshall Tucker Band. Fast forward to now, one year after the 2018 release of their 10 track self titled album, Hannah Wicklund & The Steppin Stones has amassed over 2.5mm streams on their most recent project and have been billed alongside current and legendary chart topping mainstays such as X Ambassadors, Cage the Elephant, Tom Petty, Alanis Morissette and Muse. Although Hannah's roaring guitar riffs on her custom Tom Anderson guitar and orange amp set the tone for The Steppin Stones performances, it's her vocal range and well-beyond-her-years songwriting that have led to the success of their latest release, helping to propel them to a regular mainstay festival act. Hannah's musical vision stays close to her classic rock roots, but in no way is a classic rock tribute. Their music is a refreshing focus on raw and organic emotions in a time of digitally driven recordings and performances. 2019 is poised to be a momentous year for the blossoming power trio on the road and in the studio. Hannah Wicklund & The Steppin Stones are supporting the Stone Temple Pilots, joining Peter Frampton and Joe Bonamassa on a Mediterranean cruise and bringing the heat at Shaky Knees Festival in Atlanta, GA to kick off their summer headline tour across theUnited States. Throughout the year, Hannah will be working on intimate, authentic and stripped down tracks about embracing and learning from the darker sides of life in addition to a new full band record. Hannah Wicklund & The Steppin Stones will leave their fans feeling inspired and connected in a way they haven't felt in a long time. 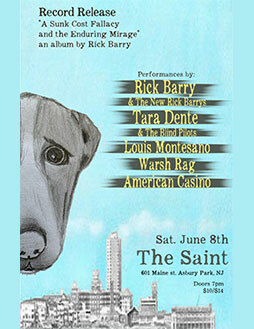 The Saint Presents Rick Barry's Record Release. "A Sunk Cost Fallacy and The Enduring Mirage" featuring performances by Rick Barry and The New Rick Barrys / Tara Dente and the Blind Pilots / Lou Montesano (The Morgan Freemasons, Status Green) with full band / American Casino / Warsh Rag featuring Avery Mandeville and Noah Rauchwerk. Todd-O-Phonic Presents From NYC, Daddy Long Legs (A Daddy Long Legs show is equal parts roots rock, blues and guttural soul; stripping down old standards and making them shiny and new again. Lowdown Ways out May 10th on Yep Roc Records.) and special guests. LP arrives on limited edition opaque white vinyl! Lowdown Ways marks a quantum creative leap for DADDY LONG LEGS, the scrappy New York trio known for their stripped-down roots sound and in-your-face intensity that's garnered them fans in their hometown and overseas, where they've toured with such kindred spirits as The Damned, Blackfoot Gypsies, Hurray for the Riff Raff and the Jon Spencer Blues Explosion. They've been recognized by Rolling Stone, who aptly compared them to "Chicago blues fired at the moon, played by the demented children of the Pretty Things." The versatility and fluency that DADDY LONG LEGS demonstrates on Lowdown Ways contrasts the raw approach that the band established on their previous three albums according to Brian Hurd, the charismatic, harmonica-blowing frontman known as DADDY LONG LEGS, and leader of the blues-bashing trio of which he shares a name. "We'd done the raw lo-fi thing for a long time, so we wanted to step out with something that was a little more produced, but still had the rawness of our earlier stuff," Hurd says. This expansive, new territory that the band covers on Lowdown Ways is thanks to producer Sutton (and JD McPherson bassist) Jimmy Sutton, with whom the band recorded the album at Chicago's Hi-Style Studios, applies his technical know-how to broaden the sound of such instantly memorable tunes as "Pink Lemonade" (co-written by McPherson), "Ding Dong Dang" and "Bad Neighborhood," which resonate with the down-and-dirty roots that have always been DADDY LONG LEGS' inspiration. Meanwhile, the band ventures successfully into unfamiliar territory with the pub-rock-style "Winners Circle," the bittersweet acoustic ballad "Back Door Fool" and the dramatic album-closer "Wrong Side of the River." The Saint Presents Prog Rock Legends Stick Men (From Woodstock, New York, Stick Men featuring King Crimson Members Tony Levin & Pat Mastellotto with Markus Reuter) and special guests. ADVANCE purchase recommended.